As marketing leaders pull together submissions for ITSMA’s 2016 Marketing Excellence Awards – due by June 10 – we’re looking back at some of last year’s award-winning programs. SAP’s account based marketing (ABM) program demonstrates a novel way to improve recognition, build relationships, and increase sales in a large organization. This well thought out program highlights the value of a comprehensive approach, including organization, planning, tactics, and measurement. As the description below highlights, SAP has demonstrated solid execution with clear objectives and metrics, a program office including training and best practice assessment, strong links with account teams, joint account planning, great marketing tactics, and substantial results. SAP North America developed an account based marketing (ABM) program to focus and customize marketing efforts for large, strategic customers. Like many mature B2B companies, SAP receives a very high percentage of revenue from a small number of strategic accounts. With the top 10% of accounts delivering up to 80% of revenue in North America, it became clear to marketing leadership that field marketers needed to become true “business partners” to both sales and customers in order to drive sustainable account growth, accelerate opportunities, and cultivate customer relationships. SAP’s challenge was to consolidate and modify previously unfocused marketing efforts, create a common methodology across regions, and maintain consistency by sharing best practices. SAP’s main objective was to add strategic value to its relationships with top accounts and to become true business partners to sales and customers. The team also focused on building future pipeline through marketing practices rather than focusing on near-term needs. The program was designed to deliver value to sales in two primary ways: 1) by enabling customers to accelerate decision-making processes, and 2) expanding the SAP presence within these large accounts. Another ABM driver was the need to extend support to a more sustainable, year-long program of activities which demonstrated to customers and sales teams alike how marketing can support a partnership with SAP—not just be viewed simply as a vendor. By utilizing the ABM marketing strategy, SAP could achieve its objective of increasing the level and quality of customer engagement as well as ensuring a long-term value recognition and growth from customers. SAP NA addressed this need through establishing a centralized Account Based Marketing (“ABM”) program office and creation of a comprehensive ABM program in 2014. ABM marketing efforts utilized a strategic approach in which highly targeted awareness and demand generation programs were executed for a specific customer. The SAP team delivered formalized training programs for a core group of marketing professionals, studied external best practices around ABM, worked closely with Sales colleagues on account selection and establishing rules of engagement, and created a marketing Bill of Materials as well as an execution engine to deliver against those tactics. Implementation of Account Planning sessions helped to identify new opportunities, as well as to ensure sales and marketing alignment. The team implemented new tactics into the ABM program, such as employing a dedicated marketer, developing an 18-month plan, and securing a budget for customized activities. Other tactics included customized newsletters and webcasts, dedicated enterprise social networking sites, account-specific digital marketing, and onsite 1:1 events. One of the most effective tactics, Customer Co-Innovation Days, brought a customized, onsite event directly to the customer. The overall focus of these events was to inform customers about how they could co-innovate with SAP. As a result of ABM success, the program has expanded to include 55 accounts in 2015, with additional budget and headcount allocated to the effort. SAP has also established a global ABM program office to leverage the success of the North American region and syndicate it throughout other regional marketing teams. The 2015 ABM program has evolved from one dedicated person to four, along with an extended team of 15. ABM funding was increased by 50% above funding in 2014. The results derived from the impressive effects of ABM marketing have demonstrated to customers and sales how marketing can support account growth, accelerate opportunities, and deliver customer value. 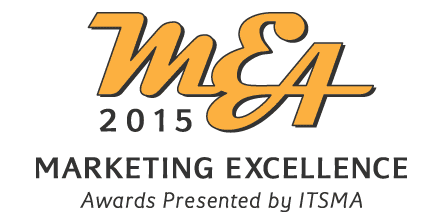 Learn more about the categories and guidelines for ITSMA’s 2016 Marketing Excellence Awards.